Running is a favorite form of exercise to burn calories, tone the muscles and improve the cardiovascular system. Running regularly can help keep excess weight off. However, your weight will also depend on how many calories you consume versus how much you burn. The key to any weight-loss program is to burn more calories than consumed. To benefit from exercise, you must eat a healthy diet regularly. "You won't believe it, but I only started running when I turned 50. I ran my first race (first photo) in Ohio. Since then I got hooked into running and lost 30 pounds. 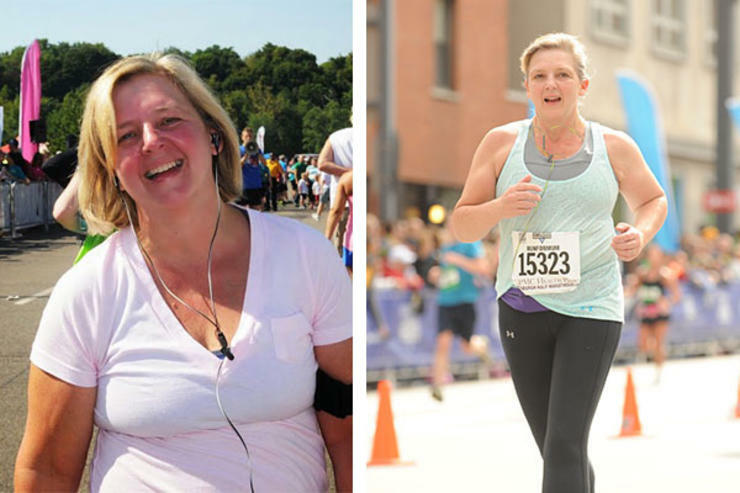 The second photo shows me running in Pittsburgh, Pennsylvania, healthier than ever." "I was diagnosed with Type 2 diabetes in 2013. I realized that I needed to eat less and exercise more to bring back my health. 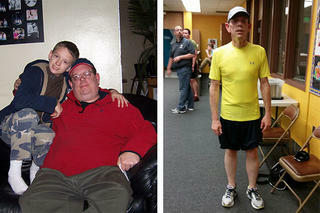 With some soul searching, I began a life journey that led to regular running until I lost more than 75 pounds. 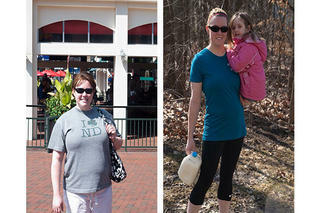 Myrunning before and after photos prove it: from over 300 pounds to just 220 and counting. I have been running in many races and marathons." 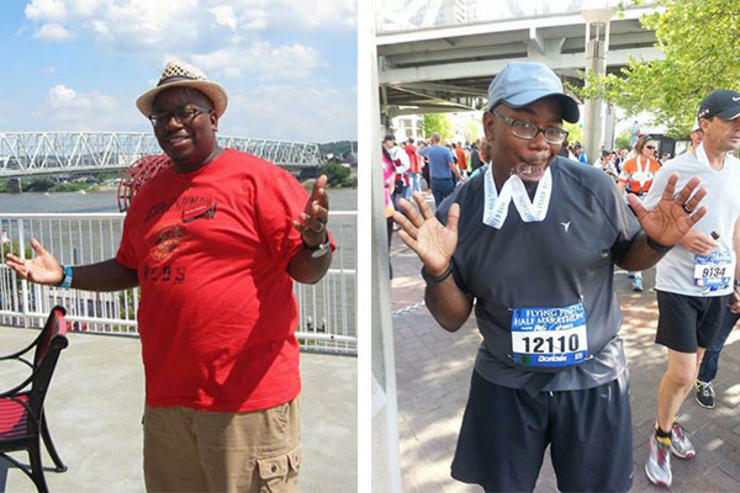 "Before I started running, I weighed around 290 lbs. But since I ran regularly and ate a healthier diet, I have lost 135 pounds within two years. 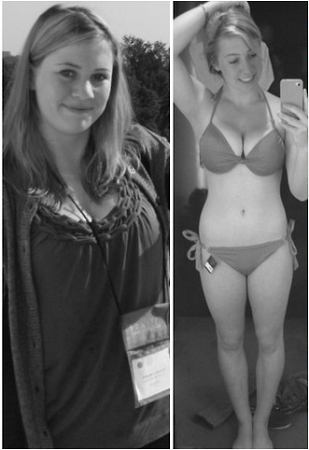 Since then I have maintained my weight loss to the present while running 25-30 miles a week. " "The photo on the left was taken in June, 2011. I weighed 215 pounds then. 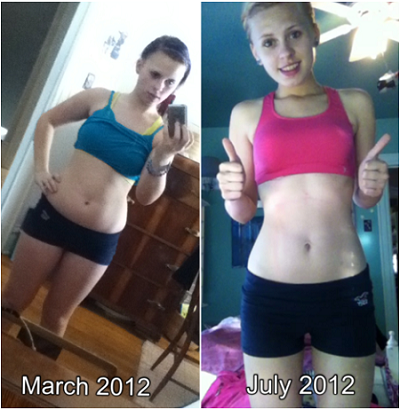 The photo on the right was taken in March, 2012, when I weighed 160 pounds. My running before and after weight got a bit disrupted when I got pregnant when I had to temporarily stop running, but now I am starting to lose all my excess weight again!" "I used to be a competitive gymnast but since I retired five years ago, I began gaining weight fast. I used to work out at least 25 hours a week and ate a healthy diet to meet the demands of my sport but when I stopped, I exercised less and just kept on eating a lot more. When I realized what happened, I got back to regularly exercising by running and lifting weights. I also went back to healthy eating." "I used to be a fat kid in school. At 80 kg, I was never happy and I had low self-esteem because of my weight problem. But finally I decided I needed to do something about it, especially when I met a boy whom I fell in love with. I decided to eat a low calorie diet and do more exercise like walking and running. At first it was difficult, but seeing my body become leaner gave me more inspiration. 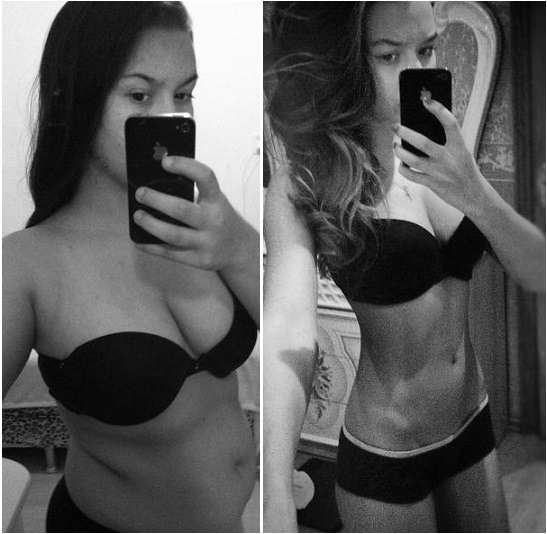 If you look at my running before and afterphotos, you will see a more confident girl who is finally at peace with herself." "I'm a fifteen years old cheerleader who is also a vegetarian since the age of 8. It was hard at first, but I wanted to prove to people that I can do it. What made me start running is when my parents got divorced. They lived 5 miles away from each other. To me, that was running distance. That's how I maintained my body in top form as a cheerleader." Your body will slowly adapt to regular running routine. In time, running two to three miles will feel easier. However, you must limit running to just three to four days a week. Resist the urge to run faster so your body can catch up with your metabolism. Next, you must make a commitment to run regularly. Not only will your body improve physically, you will also experience more self-confidence and an increase in your energy levels during the day. If you are seriously trying to lose weight, you must follow a disciplined program that ideally starts with walking and running.You will lose more weight with longer workouts done at lower intensity. For more results, add strength training and shift to running-only workouts (no walking). Make sure that your body can handle longer and faster running. At this point, it will be helpful to have a personal trainer plan your workouts and training. To continue losing weight using a running program, try to increase the volume of your workouts by increasing how far and how long you run. Although it is easy to lose the first few pounds, a 20-minute run may not help you keep on losing weight at the same rate. It may be easy to desire to run faster in order to burn more calories. But you will also increase your risk of injury. It is therefore important to work with personal trainer or coach who has some knowledge in running training and who can help you avoid injury. Why Do You Get Diarrhea After Working Out?